In cases where a tooth has sustained extensive damage, a dental crown may be the most suitable way to restore form and function. A dental crown, which fully covers a damaged tooth, may be fabricated out of materials such as gold, metal alloy, porcelain, or ceramic. Dr. Angie does not recommend dental crowns unless they are absolutely needed. 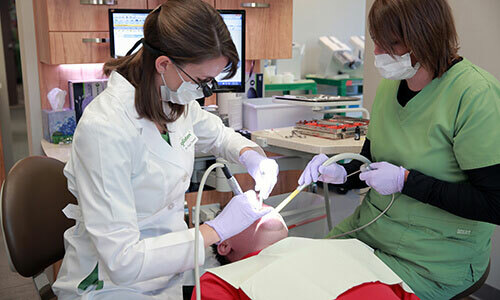 Before placing a crown, the patient will be shown his or her affected tooth with our intra-oral camera, and will be fully informed of the exact reason a crown is needed, as well as what could happen if the treatment is not performed. A dental crown may be used as a part of root canal therapy, with a dental implant, or with a dental bridge. A dental bridge has long been the standard method of replacing a lost tooth or teeth. This prosthesis is called a bridge because it spans the gap between two teeth. To anchor a bridge, two dental crowns are needed. These crowns are affixed to the teeth on each side of the gap, permanently supporting the dental bridge for full functional chewing. At Glisten, we are committed to the longevity of our restorations. We work with a local dental laboratory that uses the highest quality materials, rather than ordering restorative pieces from other countries to save money. The type of dental crown placed will depend on the patient's situation and budget, chosen after a thorough evaluation and consultation with Dr. Angie. Following minor tooth decay, chips, or cracks, we will likely recommend a filling to repair your damaged smile. Traditionally, fillings were made from metal amalgams that were put in place using wedges carved into the healthy tooth structure to hold the filling in place. Today, we use tooth colored composite resin. Originally, many people assumed these filling materials would be much weaker than their metal counterparts, but the unique restoration process actually leads to a stronger and longer lasting result. We begin by removing any damaged tooth structures. Then, we apply putty like resin directly to the tooth, shaping it into position. Once in position, we use a curing light to harden the filling into place seamlessly filling in cracks and crevices in the tooth. Following the loss of even one tooth, our team is here to help you fully restore your smile from the roots up using dental implant supported replacement teeth. Dental implants are small, titanium posts that fuse with supportive bone and gum tissue, recreating healthy tooth roots and delivering long lasting, self-supporting tooth replacement solutions. Depending on the number and location of missing teeth, we can use a single implant supported dental crown or two or more implants to support a fixed bridge, partial, or full denture, recreating healthy, beautiful smiles. The dental implant tooth replacement process is completed over the course of several phases of treatment, but in many cases, the results will last decades. Dental crowns are used to cap a tooth, to anchor dental bridges, or to top off dental implants for tooth replacement. In our Tulsa, OK dental office, we show the extent of damage to our patients via imaging from our intra-oral camera. We also carefully explain options for repair, helping each patient come to their own conclusion on materials for crowns. To repair a damaged tooth, a dental crown is crafted as a cover that encases the visible portion of the tooth. Made from a variety of materials, the most common being porcelain-fused-to-metal, crowns restore the greatest amount of structure and, therefore, strength to the tooth. Porcelain-fused-to-metal crowns are strong and attractive. The metal base holds up to intense pressure, while the porcelain overlay looks just like natural tooth enamel. In some cases, missing teeth may be best replaced with a partial or full denture appliance. Partial dentures are designed for the replacement a few teeth when most of a patient's natural teeth are intact. Customized to suit the patient's facial contours and coloring, a partial denture appliance is affixed to a few natural teeth with the use of clasps. When all teeth are lost or need to be removed, a full denture appliance can restore a beautiful and functional smile. As with partial dentures, a full denture appliance is custom made to fit snugly against the existing jaw structure and gum tissue. Although the traditional denture appliance is suitable for the replacement of teeth, it is highly recommended that a denture be supported by dental implants. When a denture only sits on top of gums, the bone of the jaw will shrink over time. As this occurs, a once well-fitting denture will become loose and need to be modified for a better fit. Used in conjunction with a few dental implants, a denture appliance becomes more secure and even healthier, as the jawbone is adequately stimulated to maintain its shape. Our teeth are body parts that are just as alive as any other vital organ. However, being alive does not make our teeth impervious to damage. A tooth may become significantly affected by decay or physical trauma, leading to an infection in the root canal. In most cases, this damage is not detected until pain occurs. Sometimes we detect the need for root canal therapy during routine examination and x-rays, so pain is not always our first warning sign. Just the mere mention of "root canal" sends shivers of fear down some people's spines. The procedure of root canal therapy is intended to remove damage and infection, and thus, pain. Root canals do not cause pain, regardless of the bad reputation they have received over the years. This form of restorative care is used when the pulp of a tooth is damaged through infection. Without treatment, this infection only worsens and leads to complications such as an abscess or the loss of the affected tooth. Our team is committed to helping patients maintain their healthy natural smiles for a lifetime, but in some cases, tooth extraction is the best way to maintain your oral health. We’ll always do our utmost to preserve healthy tooth structures, but in cases of severe decay or damage, crowding, impaction, or other oral health concerns, we can also remove teeth to preserve overall oral health. When a tooth has fully erupted from the gum line, we may be able to simply pull it free from the socket. In the majority of cases, we will need to utilize some surgical extraction methods like removing soft tissue to reveal additional tooth structure, drilling into supportive bone tissues, or breaking the tooth into smaller parts. When necessary, we will also be happy to provide tooth replacement options to renew your smile following extraction.